So, you’re looking to make some ice cream? Great idea! Making your own ice cream can be a great choice, whether you’re looking to be more health conscious or you’re just looking for a fun activity to do with the kids. Ice cream has been the staple dessert within US households for over a century, with the majority of Americans (90% or more!) having some ice cream in their freezer. And if you’re interested in getting yourself a decent ice cream maker, then you’re in the right place. Although the majority of my experience is with larger commercial ice cream machines, I do know what it takes to make a good ice cream maker, too. Here, I’ll impart some of my many years of wisdom onto you, so that you can get yourself an product at the most affordable possible price. If you are looking for the best maker available at a pretty reasonable price, then this is probably the best that you’re going to find. For the majority of people, you don’t need a massive ice cream maker for your needs. That’s why I’d advise going for this one – it makes enough for a full family (though you won’t have much left over). Beware though that some recipes you’ll find online may be a little bit too big for this , so you might have to cut down on the amount of ingredients that you’re using. If you prefer to have a totally removable bowl, then this is an ideal option. You do need to bare in mind two things however. Firstly, you’ll need to leave the bowl in the freezer the night before to prepare it. And secondly, this makes it much easier for washing up. I like ice cream makers without the removable bowl too, but this makes it easy to remove the bowl and wash it quickly and easily. Make sure that you reduce the amount of ingredients that you’re using in this if you’re following recipes you’ve found online. A lot of the recipes you find online will be for two quart makers, which is a little bit too much for the size of this one. Cheap Price – There aren’t many better options available at the same price as this one – it’s definitely giving you good bang for your buck. Easy to Use – If you’re like me, you want to use this at your home with your kids. So, it’s important that kids can use it too! It’s really to use this one, even for young kids (though you should supervise them to make sure they don’t make a mess!). 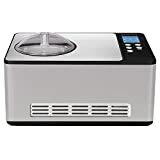 Quick at making ice cream – Compared to some other machines where you are waiting ages for your ice cream to be done, this works within a short period of ice. Great if you want ice cream fast! Not great for the dishwasher – Although it’s labelled as dishwasher safe, this isn’t actually ideal for dishwasher use due to the material it’s made from. It’s much better to hand wash this, like it is for the majority of stuff in your kitchen anyways. Must Freeze Beforehand – Like the majority of ice cream makers, you’ll have to pre freeze the bowl of this one in advance of using it. This can be a bit annoying if you want to make impromptu ice cream on the spot. The plastic casing is cheap – Okay, we’re not paying out big bucks for this. But, the plastic could be a bit better quality than it currently is. 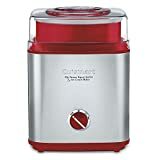 This is my choice for the best ice cream maker for the majority of families – you’ll get just about the perfect amount of ice cream for a family of four. My top pick for easy ice cream at a pretty affordable price, too. The Hamilton Beach Automatic is a better choice for those looking to make a large quantity of ice cream in a short period of time. In about half an hour, you can have around 4 quarts of ice cream – which means this is faster than the majority of it’s competitors. If you like to make healthier ice cream, then it can be a wise decision to opt for a large automatic ice cream machine like this one. It works well with both regular ingredients and ketogenic ingredients, so if you’re trying to cut carbs out of your diet then making your own ice cream can be a great way to still enjoy a dessert. Some people like fancy buttons and flashing lights on their kitchen appliances. If like me, you like simplicity, then you’ll appreciate this automatic ice cream maker. There’s no fancy buttons that I don’t understand. No flashing lights telling me things I don’t need to know. Just a simple machine, to make simple ice cream. From a negative perspective, don’t expect this to last you forever. It’s made from relatively inexpensive aluminium, so it’s not going to have the shelf life of one that costs you hundreds of dollars. But for it’s price, it’s one of the best options around. Works quickly – This ice cream maker only takes about half an hour to make you some delicious ice cream. If you have young kids, you’ll appreciate the need for speed! 4 quarts is more than enough – One thing that I like to do it make ice cream on a weekend, and save it for the whole week. This is perfect if you want to make some ice cream and freeze it for dessert during the weekdays. Relatively cheap for it’s size – Usually larger ice cream makers run at a higher price than their competitors, but this isn’t the case with this Hamilton Beach one. No slide latch – Unfortunately with this one, there’s no sliding latch to open it up whilst it’s mixing. This makes it a bit annoying if you wanted to make a nut ice cream, as you’ll have to add it after and stir it in yourself. Takes up a ton of room – I know it sounds kind of silly, but this is a beast of a machine. If you only want an ice cream maker to make ice cream occasionally, you’ll like want to opt for something else that you can fit more easily into your kitchen. Works best with plain flavours – As with most ice cream makers, this one works best with plain flavors like vanilla and strawberry. If you’re feeding the whole family, then it can make sense to opt for a large machine like this one. For it’s price, it’s arguably one of the top ice cream makers for the money. The ICE-30R is the daddy of the Cuisinart family and is one of their better options if you’re looking for something larger than the ICE-21. It makes 2 quarts of ice cream, which is enough for the family (and you’ll probably have a little extra left over, too). One of the better things about this one if you compare it to similar machines is that it can make ice cream in as little as 20 minutes. With some machines, you’ll have to wait hours for your ice cream to be ready – fortunately, that isn’t the case here. Another good thing that you may prefer about this ice cream maker is that it has a relatively large mix in spout. This is perfect for those looking to make high quality ice cream and add in some of their favorite ingredients – it can very boring sticking to plain old vanilla. If you prefer a heavy duty product – one that you’ll use every week – as opposed to a smaller one that you just use for the odd occasion, then this may be the perfect option for you. If you want to make luxury ice cream – If you’re not interested in sticking to just vanilla and you want to try other recipes, this is a good option for you. Generally, if you want to make flavors like you see in the stores – think Ben & Jerry’s – then ultimately this type of ice cream maker is a better choice. Sure, it might run you a few extra bucks but it’s necessary if you to make premium flavors. Latch to add goodies – Unlike the Hamilton Beach Automatic, this has a latch to add in your favorite extras. Pro tip – pecans make an awesome addition to most flavors! Works well with B&J – The Ben and Jerry’s Recipe Book is one of the most popular ice cream recipe books around, and it works exceptionally well with this ice cream maker. Not quite as big as it states – Whilst it’s advertised as a 2 quart ice cream maker, it’s actually slightly below that in size. Noisiest machine ever – Okay, so maybe it’s not the noisiest machine in the world, but it’s definitely up there in my opinion. Low quality materials – This one is made with relatively low quality materials, so you might notice some wear and tear after several uses. Not a bargain like the first two I mentioned, but still a good choice if you need something a bit bigger. 4-QUART CAPACITY - Great for party time or snack time, this unit makes 4-quarts of delicious ice cream, frozen yogurt or gelato - enough to feed everyone! NOSTALGIA ICE CREAM KITS - Unit works perfectly with all Nostalgia ice cream kits - try the Vanilla Crème, Chocolate or Strawberry Ice Cream Mixes (ICP825VAN8PK, ICP825CHOC8PK, ICP825STRAW8PK), or the Premium Ice Cream Starter Kit (ISK3). CLEANUP IS EASY - With a plastic bucket that wipes away messes with ease, cleaning up afterwards is a breeze. The Nostalgia is a retro option for anyone who wants something stylish that will fit into their kitchen easily. It’s been around for a good few years now, and has stood the test of time as one of the top ice cream makers on the market. If you’re often having parties with friends, then this Nostalgia Retro can be the focal point of your party. It looks great, and can be fun for kids to dish out their own ice cream. There are a few different variations of the Nostalgia – this is the darker wood one, whereas there is lighter looking one, too. If you want to make copious amounts of ice cream, then it’s essential that you have the right tools for the job. It’s a pretty quiet ice cream maker, which makes a difference if you compare it to the more expensive options that are available. Along with this, it’s pretty sturdy. Often with the cheaper options available, you’ll find that they’re going to break easily after a few uses. But, this isn’t really the case with the Nostalgia. Due to it’s robust build, you’re probably going to have this in your cupboards for a long while to come. Easy mix latch – Not only is the mixing latch on this easy to use, but it’s also see-through (they should make them all see through!). This means that you can see how mixed your added ingredients are with ease. Very easy to clean – Unlike some ice cream makers, this one is very easy to clean. If there’s one thing I hate, it’s cleaning my kitchenware, but you don’t have to worry about this with this. Wooden Outside, plastic inside – For appearance, the outside of the ice cream maker is made of wood. This gives it a great retro feel. But on the inside, it’s made from the same old plastic you’d find in any similar maker, which makes it perfect for easy clean ups. Works best with Nostalgia mixes – Some people may see this as a positive, but for me it’s a drawback. I like a maker that works well with all different recipes and mixes, but this one works best with Nostalgia ice cream mixes, which means you’re really stuck to one brand. 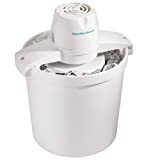 Not the best quality – This isn’t a top of the range ice cream maker, so you may want to look elsewhere if you want the tip top brands. The paddle is flimsy – The paddle is one of the most essential parts of any ice cream maker. Unfortunately, the paddle that comes with the Nostalgia is pretty flimsy so you have to be careful when using it. More of an attraction than a great ice cream maker, it still does the job. Overall, it’s a pretty ideal gift for anyone looking something run of the mill. If you’d like to get an ice cream maker with a built in compressor, then the ICE-100 may be a better option for you than the aforementioned options. It’s significantly more expensive, but it’s creates ice cream much easier than a cheaper option. An ice cream maker with a compressor is also much likely to last you a lot longer due to the high quality of materials that are used to make it. Instant ice cream – When you up the budget of your ice cream maker, you forego the necessity to pre freeze the bowl the day before. This means that you don’t need to worry about waiting, and you can make ice cream instantly. Quieter than others – Often, these kinds of machines can be noisy and kind of annoying. That isn’t the case with the ICE-100, which you’ll barely notice in comparison to your other kitchen appliances. Makes good quality ice cream – At the end ofthe day, all that we want from our machine is for it to make top quality ice cream – which this one does with ease. More effort to clean – I must admit, one thing that I prefer about smaller and cheaper ice cream makers is that you only need to wash to removable bowl. Sure, they might not be optimal, but you don’t have to worry about clean up. This one can be awkward to clean if you’re used to another one. Like, I’m pretty lazy – you’ll have to occasionally clean the gears and insides of this one if you regularly use it. Getting the ice cream out – Whilst it does come with two paddles, it can be a little difficult to actually get ice cream out! Does take a bit longer – After the pre freeze, other ice cream makers will take about 30 mins to make the ice cream. This one may take up to 50 minutes or an hour at a push. A direct competitor to the ICE-100, the Whynter is a good option if you want to avoid the Cuisinart brand. In reality, the Whynter is far better than your regular option. The reasons? Well, it’s a top of the range appliance for a few. Primarily, the Whynter competely eliminates the need to pre freeze anything, which can be super annoying if you only have a cheaper ice cream maker. Another thing that I particularly like about the Whynter is that it you have the option to leave your ice cream for 30 minutes after it’s finished making it. That means that you set the Whynter to start churning, then you can serve your dinner and eat it without having to worry about having to nip back out to the kitchen to check on it. Best option available – If money is of no issue to use, then the Whynter ICM is a fantastic option when it comes to a solid ice cream maker. Compressor – If you’ve never used a compressor ice cream maker before, then you don’t know what you’re missing out on. The difference between the two is pretty drastic, and getting one with a compressor is a complete step up in class. A compressor will help to make a smoother ice cream, in a faster amount of time. Great if you like thick, luxurious ice cream – If you don’t mind the high price, then it’s worth opting for this one if you want a top notch product. Expensive price – With higher quality machines usually comes a bigger price tag, and the Whynter is no different. This appliance is quite a bit more expensive than your run of the mill maker. Customer Service – Whilst I’ve personally never had a problem with any Whynter products, their are a few complaints that their customer service isn’t as good as some competitors on the market. Undoubtedly one of the best ice cream makers around. If you’ve got the moolah, then it’s definitely worth your investment. 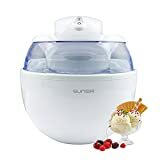 Sunsir Ice-Cream Maker makes delicious home-made ice-cream in 6-12 minutes, as well as Sherbet, Sorbet, Gelato, etc. High quality made with transparent top locks into place for safety and convenient monitoring. Make and serve it in the same aluminum bowl. No rock salt or special mixes required. A huge, pretty expensive ice cream maker with an in built compressor isn’t for everyone. If you just want to have fun with the kids, then the Sunsir Mini may prove a better option. It’s small and compact, and at only 0.6 quarts, you won’t need to worry about lots of cleaning up afterwards. Granted, this doesn’t have the technical ability of the other ice cream makers. But, it’s simplicity is what sets it apart from rest. This is ideal if you’re looking to whip up a quick delicious sorbet for the kids, or even an accompaniment to other desserts. Another thing that I particularly like about the Sunsir Mini is that you can actually take the aluminium bowl out and serve the ice cream in it. It’s a massive time saver, and the bowl won’t look out of place amongst the rest of your plates and bowls either. Make within 10 minutes – If you’re impatient like me, you don’t want to be waiting an hour for your ice cream. With this mini maker, you can whip up some ice cream within 10 minutes. Simple to use – If you want quick and simple ice cream, this is definitely the choice for you. It’s simple enough for kids to use on their own, which can be a useful and important technique to help them learn to do stuff themselves. Cheap as chips – If budget is an issue, you’ll want to make sure you’re buying something inexpensive – like this ice cream maker. Weak motor – You need to be sure you don’t overload the Sunsir Mini with ingredients, otherwise you’re going to have a struggling motor. It’s a small appliance and it doesn’t have the same power as a larger ice cream maker. Not enough for 4 – Although on the label it says that this makes enough ice cream for four, I don’t think it does. 4 hobbits maybe – but not 4 adults. Keep in freezer – Like many other ice cream makers, you have to pre freeze the removable bowl 24 hours beforehand, which can be kind of annoying. The Sunsir is definitely fun to use, but it doesn’t hold it’s own as a long term contender. Just want to have fun with your little ones? Then by all means opt for the Sunsir. 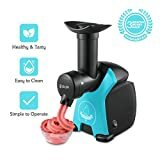 Another option for those looking for something more fun that practical, the iSiLER will have your kids screaming with joy when it produces delicious treats. If you’re a health buff looking for an alternative to ice cream that’s lower on calories but still tastes great, then it could be worth considering the iSiLER. You can turn fruit into dessert pretty easily – that’s right, no need for thickening ice cream powder or anything! Of course what you’re going to get is a sorbet equivalent, but it’s still a good option for a delicious dessert. This dessert maker comes with a free recipe book, which gives you an abundance of good ideas that you can use to help you decide on what to make. If you’d like a simple option, then this is a great option for you. Perfect for summer fun – No, it’s not going to make you the most awesome ice cream. But, it’s great fun to use with the kids. Great for healthy stuff – If you’re after making healthier stuff for your kids, then the iSiLER makes it extremely easy. Cheap – It’s not going to bankrupt you, so even if you only end up using it every now and then, it can be a fun investment. 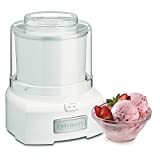 A little difficult to clean – Compared to some of the other options, this ice cream maker is a little difficult to clean properly and it’s not as easy as just removing the bowl. Not well made – The iSiLER isn’t particularly well made, but what do you really expect for this price? The iSiLER is a good option for anyone that just wants something fun to enjoy with their kids. It’s not going to last forever, and it’s not of the highest quality – but it’s a fun toy to use and can produce some awesome fruit sorbets. I’m the first to admit; soft serve ice cream is my favorite type of ice cream. So, it only makes sense that I include an ice cream maker which is specifically designed to produce soft serve ice cream! Whilst the machine does admittedly look a bit complex, it isn’t as difficult as you’d think to get the hang of using. If you’re okay with taking a while to prepare your ice cream, the the ICE-45 is a suitable option. It’s simple to use once you’ve prepared the ingredients and the maker itself. One main thing that many people don’t consider with their ice cream maker is that you’ll need to freeze the bowl or container beforehand. Of course, the larger the container, the more space in your freezer that you’ll need. This is the main reason that you should consider a more expensive ice cream maker; because it makes this much easier! If you don’t mind this, then the ICE-45 is a great option if you love soft serve ice cream (who doesn’t!). Aside from this, there are some good things about the ICE-45. It’s quiet, and makes ice cream in a different way from the majority of competitors on the market. You just need to ensure that you’re freezing your ingredients properly beforehand to get the best soft serve ice cream that you can. Cone holder makes it easy – The cone holder makes it super easy to make ice cream cones, as opposed to ice cream in a bowl like the other options available. Great if you like toppings – Using a soft serve ice cream maker is awesome if you want to take advantage of the deliciousness of sprinkles and other toppings. Delicious ice cream – Like I said, soft serve ice cream is my absolutely favorite (it reminds me of chasing the ice cream van when I was a kid!). This is the case for a lot of people, with soft serve ice cream bringing back an array of memories. There’s a knack to using it properly – To get the most out of the ICE-45, you really need to know how to utilise it properly. You MUST freeze the ingredients beforehand to make sure that your ice cream is soft enough. If you don’t do this, you’re going to get gushy ice cream. Confined to one type – If you’re using the soft serve maker, then you’re confined to one type of ice cream – you can’t really make sorbets and other delicious desserts. The topping dispensers aren’t great – The ICE-45 has three topping dispensers which sounds super cool, but they’re a bit flimsy. You’ll probably just end up using separate bowls, in all honesty. Everyone loves soft serve ice cream don’t they? If you love soft serve ice cream too, then it only makes sense to find yourself a good soft serve ice cream maker. When you’re picking an ice cream maker, you want to make sure that you’re getting the right one for you. To do this, there are a few things that you’ll want to take into consideration to ensure that you’re getting a good deal. Whilst an isn’t cream maker isn’t the biggest purchase you’ll ever make, it’s worth getting something that you’re definitely going to use. Machines with a compressor tend to be a little more expensive in price, so it’s worth thinking about whether you need an ice cream maker with a compressor built in. A compressor can help you to make smoother ice cream, primarily because they churn and freeze the ice cream much fast than those without. But, an ice cream maker with a compressor isn’t a must to make good ice cream. Although you might not think that the size of your ice cream maker is a big deal, it can prove to be an issue. If you’ve already got a packed out kitchen, then a big and bulky beast can be the last thing that you need. So, consider your situation. If you’re just looking to make the occasion bowl of ice cream with the kids, then get a more compact ice cream maker. But if you’re going to be doing it every weekend or you’re entertaining guests, then you may need something larger. Of course, the price is something you’re going to have to factor into any purchase. This is true for ice cream makers too. As you can see from my list, they can range from 25 bucks to 225 bucks! It’s worth setting yourself a budget before deciding on what one you’re going to get. If this is your first ice cream maker, then there’s no need to spend more than $50-100. Overall, it’s really down to you to decide what the best ice cream maker for you is. In my experience, the ICE-21 is the perfect entry level maker if you’re looking to just get started making ice cream. If you’re looking for something a little bit more luxurious, then the Whynter ICM-200LS may prove to be a better choice for you (though it’s five times the price!). You might also want to consider an ice cream scoop if you’re planning to make ice cream often. Making ice cream can be an awesome way to spend time with your family, or even a way to break the ice (cream) on a first date. So, make sure that you get one that’s good enough quality that it’s going to last you a good while. Hey Mike. I’m hoping you can help me. I’ve tried making Ice cream a couple of times now, and it always seems to come out really icey! I’ve followed the recipe I swear, do you have any tips for me to make ice cream that’s a little less.. icey? Your problem is probably the number one people that people have with ice cream makers! I should have mentioned it in the article. Anyway, here’s two main tips for you to try and produce ice cream that’s a little less icey. 1. I’m assuming you’re using an ice cream with a freezer bowl, right? You need to make sure that the freezer bowl is frozen – like, really frozen. This can make all the difference between ice cream and ice-y cream. 2. When the ice creams made, put it in the freezer STRAIGHT away. I mean literally as soon as it’s made! This will help to maintain the size of the formed ice crystals in your ice cream!